Photo by Jonathan Stevens Cleaning in progress. 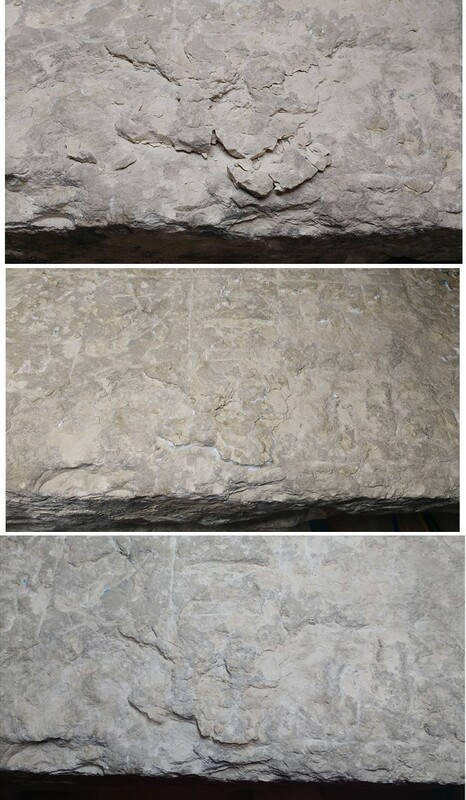 Most of the background of this limestone block has been dry-cleaned using white rubber erasers, vulcanized latex sponges and cosmetic sponges. The brighter areas are clean and any area that looks gray has not been cleaned yet. Cleaning is fun, especially when the results are so nice and neat! Anna had the chance to rejoin two block fragments, something that we haven't been able to do much of because of the size and weight of most of the blocks, even though some are broken and we know how they fit together. Photos by Anna O'Neill For this piece, both the main block and missing fragment were cleaned and the break edges consolidated with 2% w/v Paraloid B-72. Then the fragment was adhered with 40% w/v Paraloid B-72 and held in place with straps overnight until the join had set. The cracks were filled with a white Paraloid B-72/glass microballoon mixture, which provides support to areas of loss and helps to protect the fragile edges along the break. The fill was then painted with Golden acrylic paints to integrate it with the rest of the piece. One of the last blocks Céline had the chance to work on also had one of the most fragile surfaces of any of the blocks. It was a lengthy, but incredible treatment. Both images below show the process of stabilizing the block's surface. After cleaning, loose and lifting fragments were secured by injecting a 30% solution of Paraloid B-72 in acetone beneath the flakes. The unprotected edges of the flakes were supported and protected with a mixture of Paraloid B-72 and glass microballoons, applied by injection with a syringe, and then in-painted with acrylics to match the surface. Photos by Céline Wachsmuth Detail of before, during, and post treatment of a section of the block. There was significant lifting and destabilization over much of the block's surface. Photos by Céline Wachsmuth Detail of before, during, and post treatment of a section of the block. This section was floating on the surface, meaning it was no longer attached. Stay tuned for a final post about the finishing touches on the Kaipure Tomb Chapel project. The Kaipure Conservation Project is funded through a generous grant from the American Research Center in Egypt (ARCE) Antiquities Endowment Fund (AEF) which was established though a grant from the United States Agency for International Development (USAID). It is something of a love story: a man and woman (perhaps husband and wife) buried together for almost 3000 years. Their small tomb chamber at Dra Abu el Naga, on the west bank of Thebes, was excavated by W.M. Flinders Petrie's workers in 1908-1909. Both individuals were provided with a single coffin, Ptah-Sokar-Osiris figure, and boxed shabtis. In a trend particularly prevalent during the Third Intermediate Period, floral material was left on both mummies. As part of the finds division system, one mummy (belonging to a temple singer named Perenbast) and her associated objects were sent to Manchester and those of her companion ('Mr Perenbast') sent to Bristol. Sue Giles pointing out the flowers on the mummy of 'Mr Perenbast'. Photo: Dyan Dodson. In March 2018, thanks to Sue's efforts, an official transfer – signed by the Mayor of Bristol – was organised to reunite Perenbast with her flowers. Their identification as lotus flowers may obscure the fact that they are in fact blue waterlilies, about which there has been much debate. Regardless, the intended symbolism is of rebirth and regeneration. Perenbast and her coffin has been the subject of particular interest of late. They are featured in both a recent documentary about Karnak and an upcoming film on the discovery of KV 64, in which Dr Aidan Dodson of Bristol University and I discuss Perenbast's station in life. It is intriguing that both the (secondary) owner of KV 64 (Nehemesbastet) and Perenbast share the element 'Bast(et)', the feline goddess associated with the Delta, in their names. Perhaps the individuals were related, or at least part of a small group that had the same distinctive black coffin with decoration picked out in yellow or white. Both were beneficiaries of the intense reuse of tombs in the Third Intermediate Period. Developer Rebel Twins releases all kinds of awesome, highly-polished games, and in the spring of 2015 they released yet another one in Dragon Hills. It mashed up several types of gameplay mechanics into one cohesive experience, with a dash of Tiny Wings here and a dose of Death Worm there, and we enjoyed it a lot in our review. Last fall Rebel Twins released a sequel that amped up an already great game in pretty much every way. We loved Dragon Hills 2 [$2.99] in our review, and after about 6 months of being on the market a significant update is heading to the game on April 5th. Check out the new trailer showcasing what's in the update. As you can see, this update will include a new Ancient Egypt environment to ride your dragon in, as well as two shiny new dragons to ride. There will also be new enemy types to contend with, and six new ultra-challenging Mega Bosses to battle. Basically, more of all the good stuff in Dragon Hills 2. If you have yet to check this one out, I'd highly suggest dropping the three bucks to give it a shot, especially since this is a fully premium, no IAP game. Things only stand to get even better when the big Dragon Hills 2 Ancient Egypt update arrives on April 5th. W. Raymond Johnson, director of the Oriental Institute's Epigraphic Survey, was featured in a U.N. Environment Programme article on climate threats to ancient structures in Egypt. In correspondence with The Maroon, Johnson provided more insight on the issues facing archaeologists and the Epigraphic Survey. The article delves into the damage that changing climate is causing to Egypt's temples and tombs. Johnson's comments focused on how the changes in climate, particularly the increase in haze, have hindered archaeological studies. The article also touches on several other problems such as unstable temperatures, increased rainfall, and human impact currently plaguing sites in Egypt. 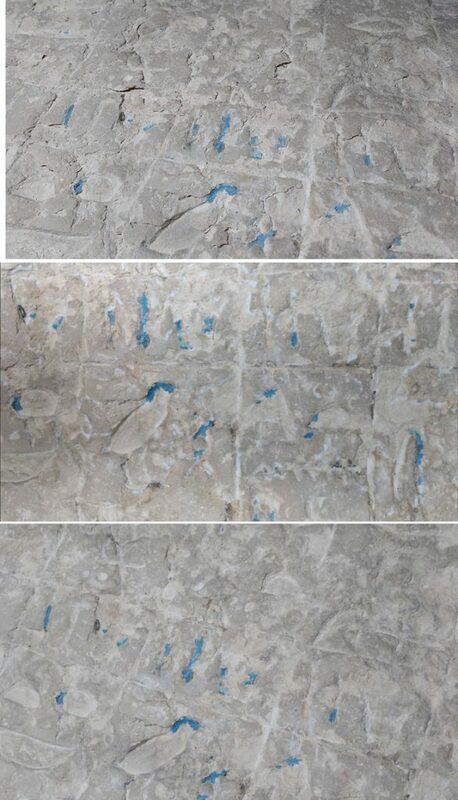 "We used to make blueprints [of the hieroglyphic inscription drawings] using natural sunlight, but starting about 20 years ago, we found it harder and harder to burn the image onto the paper," Johnson said. "It was then that we realized that it was getting hazier and hazier." The temperatures have never been as warm for as long as they have in the last few years, with excavation days being cut short due to the heat. Increases in rainfall during winter months have had a damaging effect as well. "Like all the world, we have a fear of climate change," says Mostafa Ghaddafi Abdel Rehim, a senior antiquities official, in a quote for the article. Human activity has also negatively affected the sites. The Aswan High Dam's prevention of the annual flood has allowed salt to build up and destroy the stones, while the increase in agriculture to support the increased population has driven up the water table in the East and West banks. The article elaborated on the joint effort between the U.S. Agency for International Development (USAID) and the Egyptian Ministry of Antiquities working to resolve the groundwater issue, and other efforts like surrounding archaeological zones with walls to prevent agricultural or urban expansion from invading these areas, and founding field schools to teach inspectors about threats and treasures. Despite the progress, archaeologists have increased their documentation initiatives. "There is more urgency now," Johnson said. "That's why we go first to what's most threatened." In a message to The Maroon, Johnson elaborated on the complexities of the situation as Egypt contends with unchecked development and population expansion. "The amount of land formerly desert and now under cultivation is absolutely staggering, and while it is a testament to the ingenuity of modern Egyptian agricultural engineers, drainage water from these new fields, and waste water from the new settlements represents a direct threat to nearby antiquities sites that have survived solely due to dry conditions and lack of development." Another problem that Johnson brought up is the increasing rate of reclamation of desert land as a result of these factors. Johnson referred to Google Earth images that show this change over time, and to a list of lost monuments. "During the revolution in 2011 the northern half of the only surviving hippodrome in Egypt was destroyed by cemetery expansion. The list is endless, and tragic," Johnson wrote. On the Oriental Institute's work in the Near East, Johnson commented on their responsibility as Luxor residents over the last 94 years to preserve the structures, as well as the high costs of upgrading technology and growing their mission. "Our main challenge is to expand our work in response to the changing conditions here at a time when funds for such work are increasingly scarce." Johnson also commented on issues in funding from the University, writing that "New University-wide budgetary constraints are not helping the Oriental Institute in its tasks." "The bottom line is that what nature preserved for us in the past, is now our collective responsibility, to insure its survival for future generations to study, learn from, and enjoy," Johnson wrote, sharing his concerns for the future. "While there is a sizeable Egyptian and foreign scientific community working in Luxor, there are not enough Egyptologists in the world to properly care for the wealth of monuments that miraculously survive here." The University of Chicago's Epigraphic Survey, which Johnson has directed since 1997, has been producing precise drawings and photographs of scenes and reliefs since its founding in 1924. The Survey's most recent season's work includes a digital documentation initiative in the blockyards at Luxor Temple; film and digital documentation of a private tomb in western Thebes; and continued documentation, conservation, site development, and restoration at Medinet Habu with a grant from USAID Egypt. While the precise, scientific documentation and publication of Egypt's cultural heritage sites continues to be its primary work in Luxor, the Survey expanded its mission in the mid-1990s to include restoration, conservation, and site management in response to rapidly changing conditions in Egypt that are accelerating decay of the ancient monuments. The Survey is based out of Chicago House, the Oriental Institute headquarters in Luxor, Egypt, and maintains the Chicago House Library, which has the largest collection of volumes on Egyptology in southern Egypt. In 2019, the Oriental Institute will celebrate a century of dedication to the preservation of ancient heritage sites all over the Near East. Ancient Egyptian leaders increased their empire's grain production and crossbred cattle for resilience in an early effort to ward off climate disaster, a study shows. More than 3,000 years ago the queen of the Hittites, who lived in what is now Turkey, sent a clay tablet to Ramses II, the Egyptian pharaoh, with an S O S: "I have no grain in my lands." Previously, the two kingdoms had been at war. Now a severe drought was carving a path of destruction through the ancient Levant, killing crops, cattle and people. But the Egyptians, unlike the Hittites, had anticipated a crisis and planned ahead for a food shortage, researchers at Tel Aviv University say. And in an attempt to stabilize their borders, the pharoahs appear to have mounted a relief effort, sending grain to their former enemies. In a study published in this year's edition of the journal Egypt and the Levant, the researchers pieced together ancient evidence — including flint and bone records from the fallen city of Megiddo, fossilized pollen data from the Sea of Galilee and ancient cattle DNA — to shed light on how Bronze Age Egyptians foresaw and planned for a drought that would last from around 1250 B.C. to 1100 B.C., while their ancient counterparts appeared to be less well prepared. Even with preparation, however, the Egyptian empire ultimately collapsed. But the study shows how recognizing and preparing for climate disaster can make societies more resilient. "All this put together, you see a picture of a crisis and the reaction of an empire in order to try to stabilize the situation," said Israel Finkelstein, a professor of archaeology at Tel Aviv University and the lead author of the paper. "For a while they managed, and then it was too late." For about a decade, archaeologists have known that widespread drought in the Mediterranean was a culprit in the fall of civilizations there in the Late Bronze Age. But it is only in this latest study that evidence of the pharaohs' prescience has emerged: In anticipation of a crisis in their empire's southeastern arid zones, ancient leaders ordered increased grain production in its greener parts, and crossbred local cattle with zebu, or humped cattle, to create a more heat-resistant plow animal, the researchers found. At the ancient ruins of Megiddo in northern Israel, Dr. Finkelstein and his colleagues also discovered sickle blades used for harvesting grain, and an unusually high frequency of cattle bones. The age of those bones indicates that the animals were used for plowing crops, rather than eaten, explained one of the paper's authors, Lidar Sapir-Hen, an archaeozoologist from the Steinhardt Museum of Natural History at Tel Aviv University. "This collapse of the Late Bronze Age is not just a matter of ancient history that has no relevance to us," said Eric H. Cline, a professor of classics and anthropology at George Washington University, who worked at the Megiddo site for two decades but was not involved in this latest study. Just as drought was among the "stressors" leading to famine and war during the Bronze Age, Dr. Cline said, today's droughts could amplify existing problems. "It's a perfect storm: You've got not just drought and famine but there's also earthquakes, there's also invaders, and that's what causes collapse," he said, referring to a confluence of events which some think led to the end of the Bronze Age, which included powerful earthquakes in the region, and the invasion of the Levant by a group known as the Sea Peoples. The ancient world, like our own, was interdependent and suffered a "domino" fall, Dr. Cline added. Gavin A. Schmidt, the director of the Goddard Institute for Space Studies at NASA, said that in some ways, modern civilization had not advanced much in its coping mechanisms for climate crises. "If the sea is rising, you either get out of the way, or you get flooded; if there's a drought, you either plant more drought-resistant crops, or you die," he said. But, he added, modern humans possess much better predictive power and are therefore "the first generation who is able to take mitigation seriously." Yet many countries are still behind on goals set as part of the 2015 Paris climate agreement. "This is the tragedy," said John F. Haldon, a historian at Princeton University who studies how ancient civilizations coped with climatic upheaval. "Everyone's aware of the problem but there's a massive stasis in the system." If a civilization's leadership "has feet of clay and isn't willing to take the challenge on in an innovative way," Dr. Haldon said, "then often the challenge will overcome them." Present-day humanity may have the resources and tools to deal with climate change, Dr. Haldon said, but action is often stifled by those who have a vested interest in denying the reality of human-caused climate change. "We seem to have the idea that people in ancient times or people in the past generally weren't quite as clever as we are, but Homo sapiens is Homo sapiens," he said. "If it's something that we are creating — and we see what happened the last time — I think we'd be foolish not to take steps to stop it," Dr. Cline said. "The problem is when we have deniers," he added. "Then we're no better off than the Hittites." Like Barbra Streisand, Elton John and Cher, Tutankhamun, boy king of ancient Egypt, periodically goes on a world tour for what may or may not be a last live performance for the fans. Or, in Tut's case, the last dead performance. Tut is all about the tomb, the afterlife and desperate immortality — a fantastically grandiose and convoluted system that would help define Western civilization for the next several thousand years. He's back now. "King Tut: Treasures of the Golden Pharaoh" is newly opened at the California Science Center in Exposition Park, where a nearly 10-month run kicks off a multiyear, multi-city tour, mostly in Europe. Why an art and archaeology exhibition is at a science museum is not exactly clear. Yet, the show is superior to "Tutankhamun and the Golden Age of the Pharaohs," a tacky for-profit entertainment that was at the Los Angeles County Museum of Art in 2005. This one is also commercially packaged by a global entertainment agency, IMG, but the generally fine material in the exhibition's main galleries is more coherently displayed. The California Science Center opens the traveling exhibition of items from Tutankhamun's tomb. What killed the boy king at 19 might be a mystery (infection from a broken leg is now the presumed culprit), but there's nothing cryptic about why this show has turned up. Egypt has a problem: Too much chaos, not enough tourists. Tut is sightseeing's celebrity pitchman. Turmoil has been a mainstay in modern Egypt, now run by a brutal military dictatorship. In a 2013 coup, Gen. Abdel Fattah Sisi overthrew Egypt's first democratically elected president, imprisoned thousands of dissidents and massacred more than 600 men, women and children at a peaceful sit-in near Cairo's Rabaa al Adawiya mosque. Just over two years ago, 244 passengers and crew were killed in a suspicious charter airplane crash in the Sinai Peninsula. Tourism has long been a mainstay for the Egyptian economy. Current numbers are barely over half the all-time high in 2010, just before the political uprising, according to figures tracked by the Central Bank of Egypt. Lately the numbers have been inching up, but public perceptions of instability threaten a huge new tourist attraction. The Grand Egyptian Museum is a massive complex near Giza, about 10 miles outside Cairo. Almost 20 years in the making and, according to some reports, costing about a billion dollars to construct, the project is about a decade overdue. Tens of thousands of artifacts have been transferred from Cairo's fabled Egyptian Museum of Antiquities, new staff offices are occupied, and critically important conservation labs are up and running. But the galleries are unfinished — including those for virtually all 5,000 objects found in Tut's tomb, the project's chief tourism lure. The museum's opening has already been postponed a couple of times. A scheduled May debut was recently pushed back perhaps two years, just as the traveling Tut show is to finish up. At the California Science Center, the exhibition design for these gilded wood sculptures and assorted implements of daily life is overly theatricalized. Apparently, it is impossible to show ancient Egyptian art in an American museum in something other than darkened galleries made eerie by atmospheric blue lighting and pin spots, a New Age soundtrack humming in the background. The Duat, ancient Egypt's realm of the dead, was indeed a nighttime underworld, and it was also dark inside Tut's intact tomb, where the undisturbed artifacts were famously discovered in 1922. But commercial packaging goes for the conventional every time, and this show's familiar mannered wrapping is no different. It is, however, much lighter on the visual razzle-dazzle than the tawdry LACMA outing, and that's a benefit. After an entry gallery where an introductory short subject on pharaonic Egypt is projected onto a 180-degree screen, gold-colored doors open automatically (think crowd control), allowing entry into the first of nine galleries. The show unfolds in about 150 artifacts. Sparingly deployed digital screens include a useful animation that shows how Tut's four canopic jars — storage vessels for his liver, stomach, lungs and intestines — were elaborately packed inside a ceremonial chest. Nearby, the handsomely carved alabaster lid of one jar shows Tut's serene countenance at its most Michael Jackson-like. The showstopper: a sentinel that guarded Tut's Ka, or life force. Blank, jet-black eyes are made from imported obsidian, staring out toward eternity. Most of the showier gold — 21 finely crafted earrings, bracelets, pectorals and other jewelry found wrapped inside the mummy's bandages — turns up in the final chamber. Many of the show's 15 wooden figures of deities are likewise gilded. Yet, the relative modesty of most of the objects is a boon. An almost matter-of-fact quality is suitable for what was then a common funerary process, hardly unique to a 19-year-old king whose brief reign (1336-1326 BC) was rather uneventful. The show is divided into four sections. Three outline the elaborate funerary process Tut underwent, from preparation for burial and a journey through the underworld to rebirth for eternity. The fourth concerns the tomb's 1922 discovery. To prepare, objects of daily life — vessels, storage chests, a chair, a miniature game board, a bed with lion's paw feet — are gathered for use in the afterlife. Materials are revealing. A simple footrest is made from woods found in sub-Saharan Africa and along the Mediterranean's east coast, suggesting the spread of Egyptian power and trade. Other wooden objects are gilded to reflect light or wrapped in incised gold sheets, while carved and painted alabaster, a soft and translucent stone that absorbs light in a gentle glow, is common. Ra, the mythic sun god, was an essential deity. In the precarious balance between life and death, he represented an element of nature hard to miss in the sun-blasted deserts of Egypt. Light's invocation is key to Egyptian funerary art. Tut's father, Akhenaten, was a radical monotheist who had suppressed the cult of Ra. But after his death, his son returned the god to prominence. That may partly explain the magnificent gold funeral mask that is the most famous of all Tut's artifacts — one not included in this show (the mask no longer leaves the country) but evoked in a later gallery by a 15-inch gold coffinette where the king's liver was stored as the mummification process was underway. Next comes the potentially perilous journey of body and soul through the underworld. Egyptian iconography is extremely complex, the means and methods of navigating assorted demons and lakes of fire not for the faint of heart. In tools, weapons and sculptures, Tut is depicted as dominating everything — man, beast, the worlds of nature and society. An image of all-encompassing power helps smooth his way. Take one of the exhibition's most arresting works, a gilded ceremonial shield. The elegant relief carving shows Tut as a warrior handily dispatching a pair of ferocious lions. Marvelously animated through a repetition of beastly legs that unfold like a fan, while their two heads twist and roar in opposite directions, the design recalls even older Assyrian bas-reliefs. The third section celebrates Tut's successful rebirth. It is introduced by the showstopper: a slightly larger than life-size sentinel that guarded Tut's Ka, or life force. The figure's blank, jet-black eyes are made from imported obsidian, staring out toward eternity, while gilded garments glisten against black skin. The body is muscular and lithe, but his pose — one foot straight ahead of the other in rigid, physically impossible alignment below a strictly upright and frontal torso — creates an authoritative spectacle of resolute, unshakable strength. This main portion of the show is on the Science Center's third floor. Down on the first floor is the concluding section, where the heavy hand of the commercial packager is felt in full, tacky force. It tells the story of the tomb's discovery by British archaeologist Howard Carter. There isn't much to see — a small gilded shrine and four pieces of jewelry, one of them the hefty pectoral with five lapis lazuli scarabs famously photographed around the neck of the water boy who alerted Carter to the steps in the sand that led to the ancient burial site. The items are nearly lost amid long walls of timelines about the discovery and Tut's celebrity aftermath, along with photographic blow-ups and video talking heads. The exit gallery offers up a kitsch crescendo. A fragment of a colossal but mediocre quartzite Tut statue that once stood outside the mortuary chamber is bathed in a pulsing sound-and-light show. A minor work of art, notable mostly for blocky bulk, has been tarted up with flanking digital videos where ghostly specters of the saga's main players fade in and out over scenes of the vast Egyptian desert. A drumroll arises, as dappled theatrical lighting brightens into full blaze on the boy king's face. The digital screens intone that simply speaking Tut's name will ensure his immortality — a marketing truism faking ancient profundity in an automated performance heavy on the ham and cheese. Time is better spent in the upstairs galleries, where a visitor is not made to feel like a pigeon. Where: California Science Center, Exposition Park, 700 State Drive, L.A.
Koch, I. 2016. Notes on Three South Canaanite Sites in the el-Amarna Correspondence. Tel Aviv 43: 91–98. The author addresses three geographical issues that emerge from the el-Amarna correspondence, all related to south Canaan: the identification of Yurza and Bit-NIN.URTA and the location of a coastal polity between Ashkelon and Jaffa. He suggests placing Yurza at Tel Haror, Bit-NIN.URTA at Deir el-Azar (biblical Kiriath-jearim) and identifying Yavne-Yam (Muhhazu) as a center of a south Canaanite city-state.